Charles succeeded his father Dean Westenholme the Elder as a distinguished animal painter, but with the difference that he received an academic training as an artist. He was an early exhibitor at the Royal Academy where he specialised in paintings of the London breweries, including ‘Black Eagle’ in 1822. Another favourite subject was the Essex Hunt and other sporting subjects with riders up, horses and hounds. As befitted the interest in historical romance at the time he was excellent at capturing period subjects such as a Hunting Picture of Queen Elizabeth and Queen Elizabeth visiting Kenilworth Castle by Torchlight. A full-length portrait of Lord Glamis in highland costume was executed in 1830 which suggests that the artist may have spent some time in Scotland. The mountainous background of our landscape with its tumbling rapids suggest a highland setting. The label ‘Highgate’ on the reverse of the picture may indicate that he may have kept the work in his studio there. 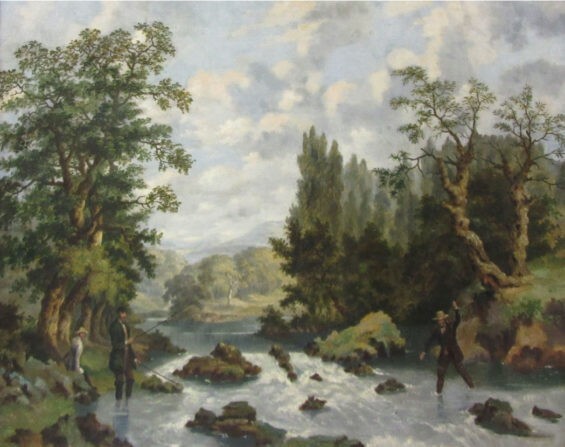 I am writing to enquire about "Anglers fishing in the rapids"